The 35.5 metre Azimut motor yacht Cheers 46 listed for sale by Bob Crow at Denison Superyachts, is sold with Babb Rawlings at HMY Yacht Sales introducing the buyer. Built in GRP by Italian yard Azimut to a design by Stefano Righini, she was delivered in 2011 as one of the yard’s popular 116 series. An interior by Carlo Galeazzi has cherry wood bulkheads with wenge inserts and fabric panels throughout. Accommodation is for 10 to 12 guests in five cabins consisting of a master suite, two VIP suites aft and two doubles forward, all with entertainment centres, LCD television screens and en suite bathroom facilities. In addition, a dedicated media room on the main deck can be converted into a further cabin with a large couch becoming a queen sized bed. The main saloon is carpeted and has a cherry wood border, and there are Roman shades and decorative curtains on the windows. On the starboard side are four settees, each with a coffee table while to port is a bar, ice cooler and sink flanked by an entertainment centre. Forward is the formal dining area with 12 leather chairs grouped around a rectangular table in cherry wood and wenge. Sliding glass and stainless steel doors give access to the aft deck furnished with a built in upholstered sofa and a fixed teak table on stainless steel pedestal bases to host 12 guests for al fresco entertaining and dining. The full-size door of the garage on the transom is operated hydraulically and converts into a wide teak swim platform with small cleats for the tender. 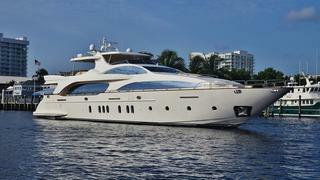 Cheers 46 was asking $6.9 million.